Take a fresh look at your people. Possessing deep reserves of energy, sincerity and generosity, they are people who are determined to work for something larger than themselves  to make a difference in the community, to uphold a sacred cause. The tendencies are there, but you must foster the proper atmosphere. Our custom awards are a part of that atmosphere. Because the best way to stimulate the performance you're looking for is to honor it. 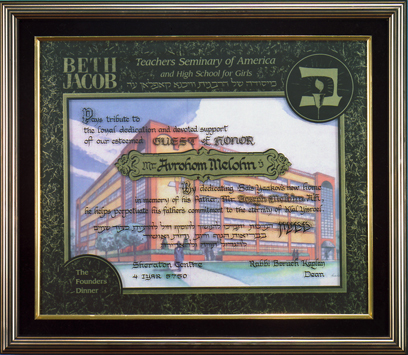 For over 20 years Chaim's awards and Judaica art have been the centerpieces of countless fundraisers and tributes. These presentations proudly displayed in many homes and offices. Now you can offer them as a gift to cherish with pride. Brilliant gold and black border, incorporating logo and function theme. Full-color background with "floating" text superimposed over it. Honoree's name inscribed on beautiful goldtone.